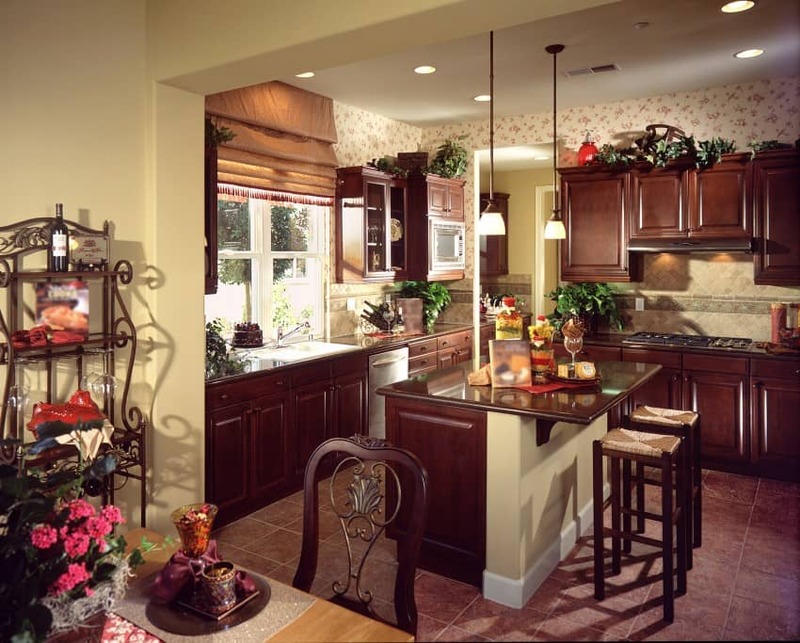 Dark-colored kitchen cabinets are a popular design choice. What is best about deep shades is that they always look so impressive and sophisticated, plus they can add a real dramatic twist to your interior color scheme. Another reason why dark colors are perfect for your kitchen is that they are so much easier to maintain than lighter shades. 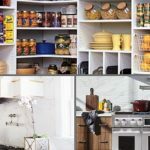 The cooking area can be messy and even the slightest splotches are an eyesore in an all-white kitchen. Save yourself some trouble and opt for a more practical solution – go dark! There are so many options to choose from – you can go with dark wood veneer or have a solid color finish. Both options are great not only for traditional designs, but also for modern interiors. Wood finishes are known to have a great effect in interior design as they add texture and inspire a sense of comfort and warmth. 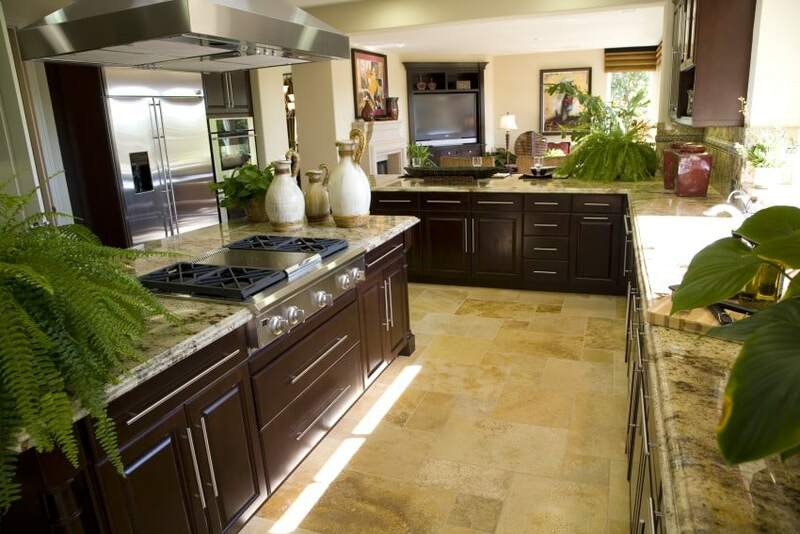 Plus, they go with a large variety of complementary materials – granite, tiles, mosaic. 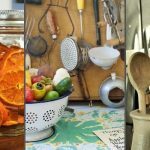 As for solid color finishes, they have a cool uniform appeal and are also easy to combine with anything, especially with materials that are rich in texture and pattern. When you choose to go with a dark-colored kitchen, do not forget to balance it out with lighter shades such as white, beige and grey. These will add some contrast and help bring out the beauty of the dark. You can have them in the floor, walls and ceiling, and even in the countertop and backsplash area. Do not forget to take care of the lighting, either. Make sure that you get enough sunlight coming in through the windows, and also have a large variety of artificial light sources to provide ambient, task and accent lighting for your design. 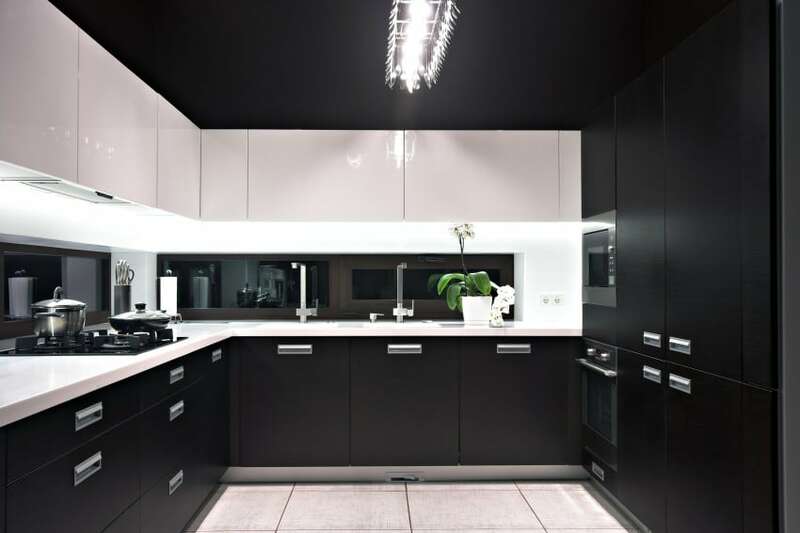 Let’s now see 20 kitchen ideas with dark color cabinets and hopefully you will get inspired for your own home project. 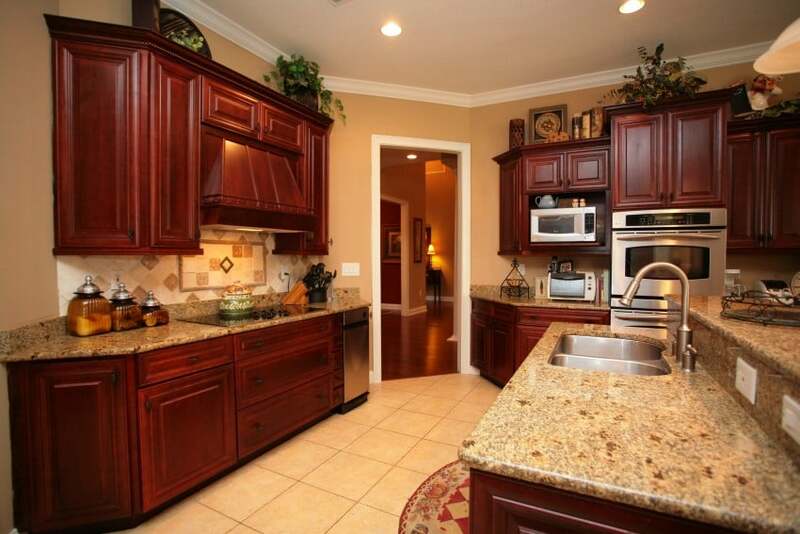 The colors of the cabinets below range from brown, dark brown, black, deep red, walnut wood color etc. 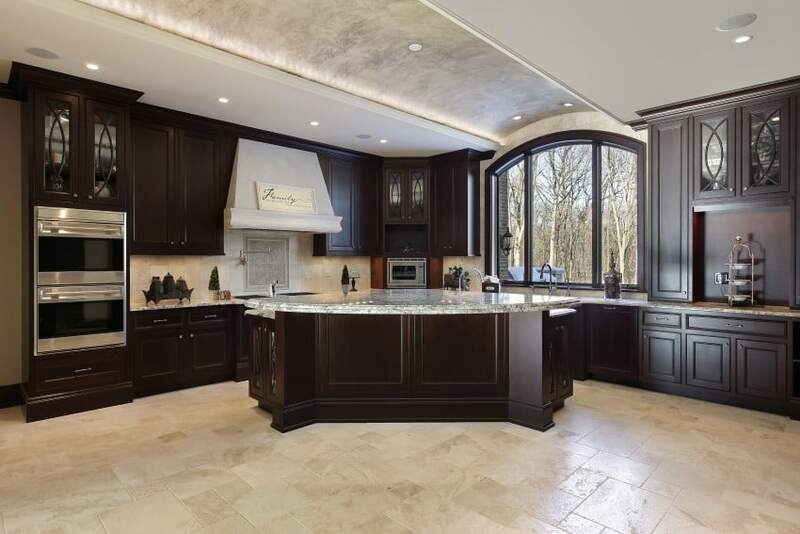 This kitchen with dark cabinetry and granite countertops looks elegant and sophisticated. It is packed with style and equipped with all that you might desire – modern appliances, lots of cabinets and plenty of worktop area. 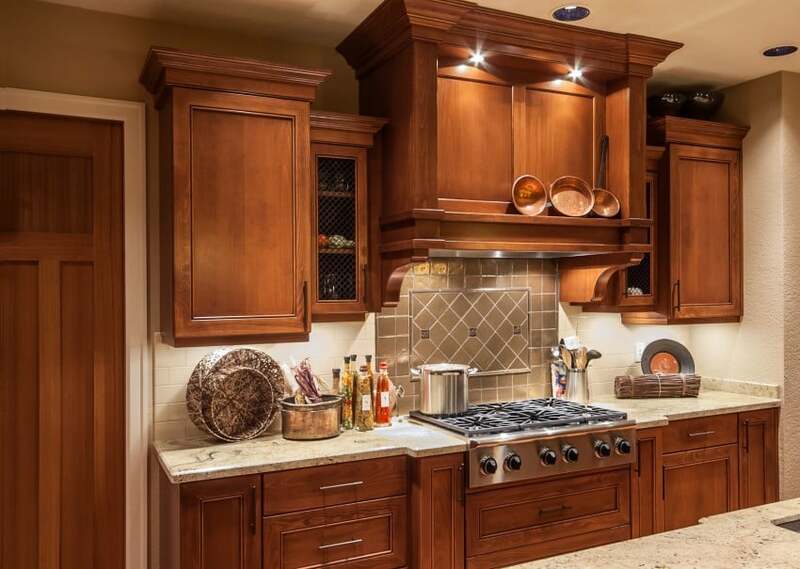 Dark brown walnut wood meets light grey speckled granite in this exquisite kitchen design. Traditional design makes for a cozy setting while modern stainless steel appliances are there to ensure a smooth cooking experience. 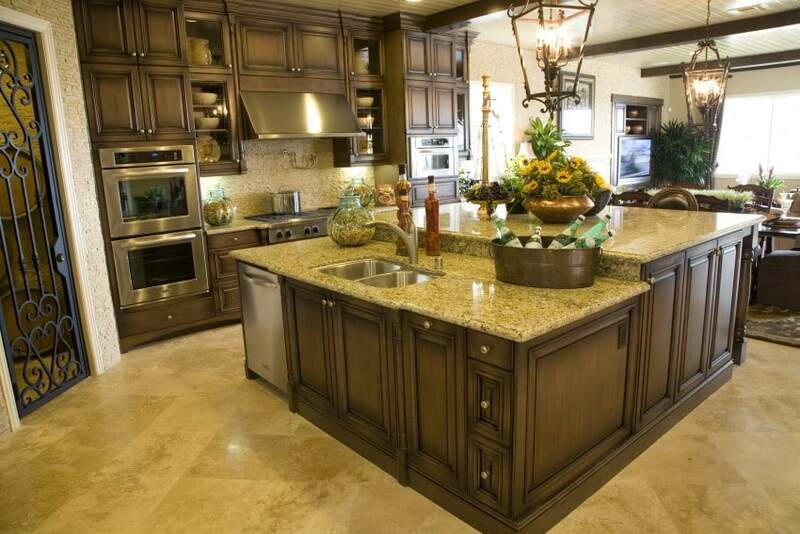 This redwood kitchen with granite countertops fits in nicely in a room with beige tiled floors and sand-toned walls. 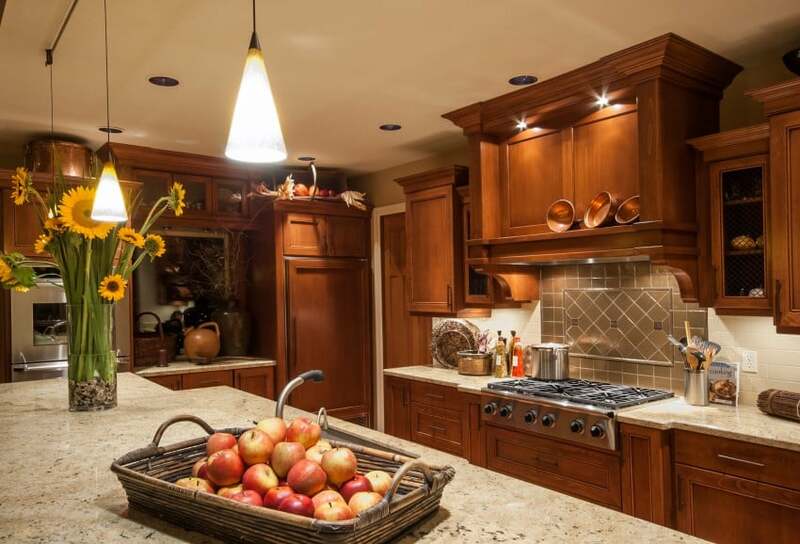 Recessed lights are the prime lighting choice here, along with a pendant right over the island counter. 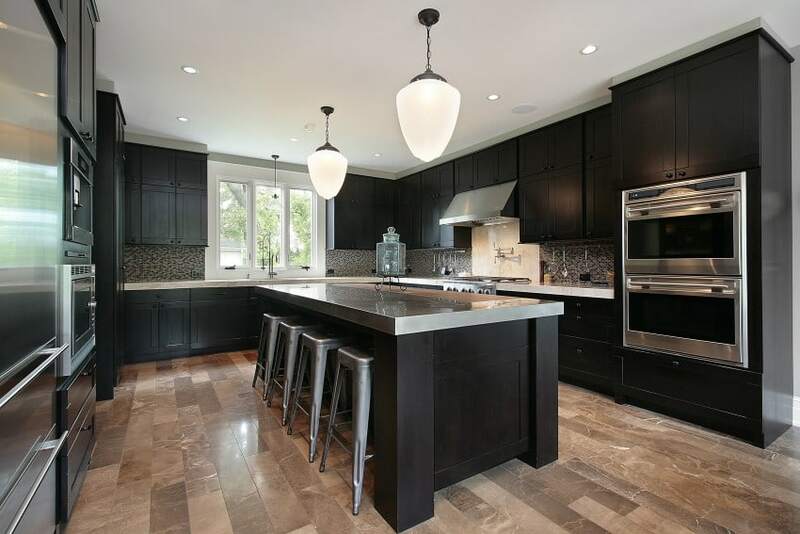 Dark wood cabinets and marble tile floors are in perfect harmony in this modern kitchen design. Shaker style doors and subtle details are a top-notch choice for an elegant and balanced design. 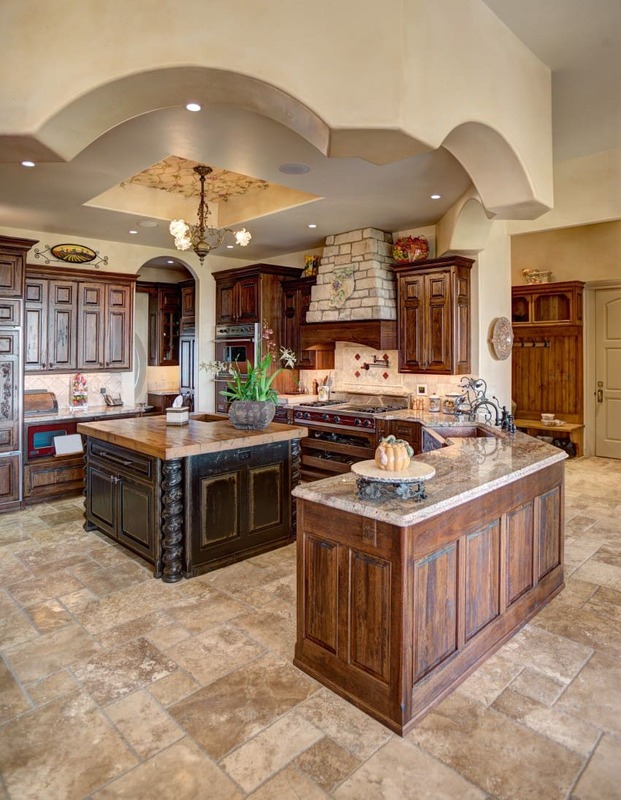 This traditional kitchen design evokes a feeling of comfort and warmth. 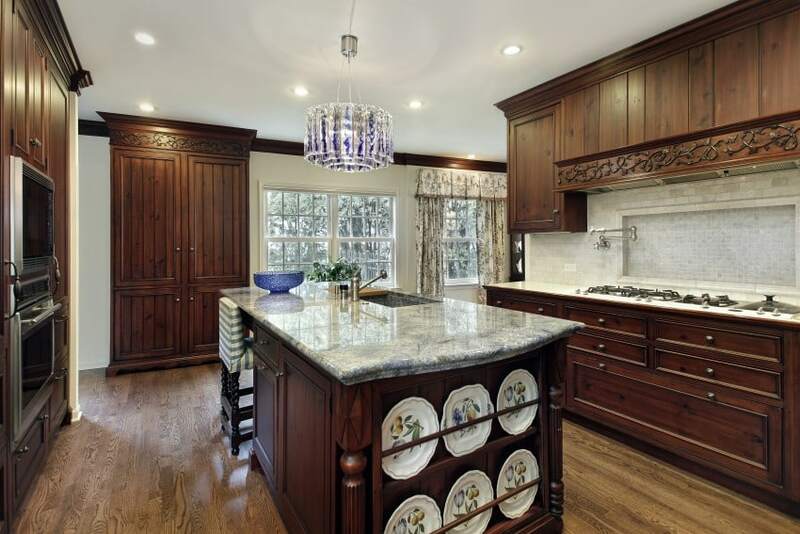 Rustic details and elegant ornamentation add character and style to a simple design in dark wood and speckled granite. A crystal chandelier adds a dash of brilliance and shine. 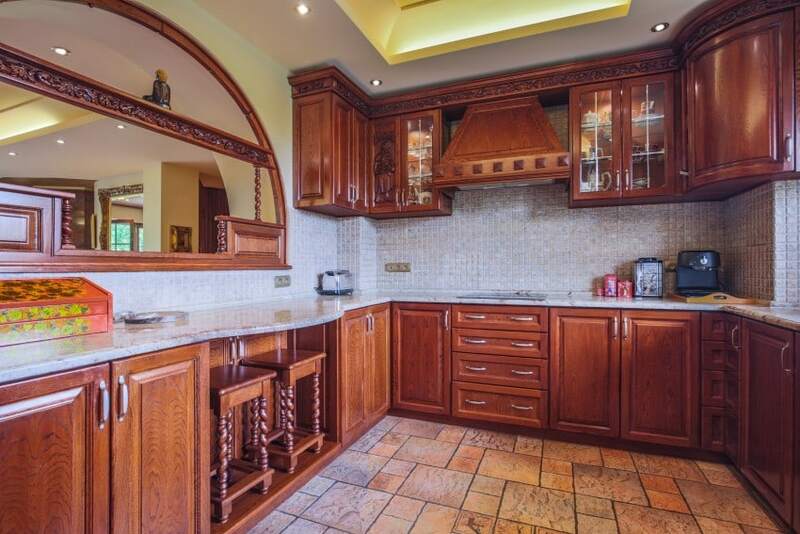 Here is another stylish kitchen with a more traditional appeal. 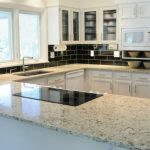 Diagonal flooring adds a modern twist in this design, as well as a glossy shine that matches the polished granite countertop finish. Modern stainless steel appliances are also a nice addition to the design. 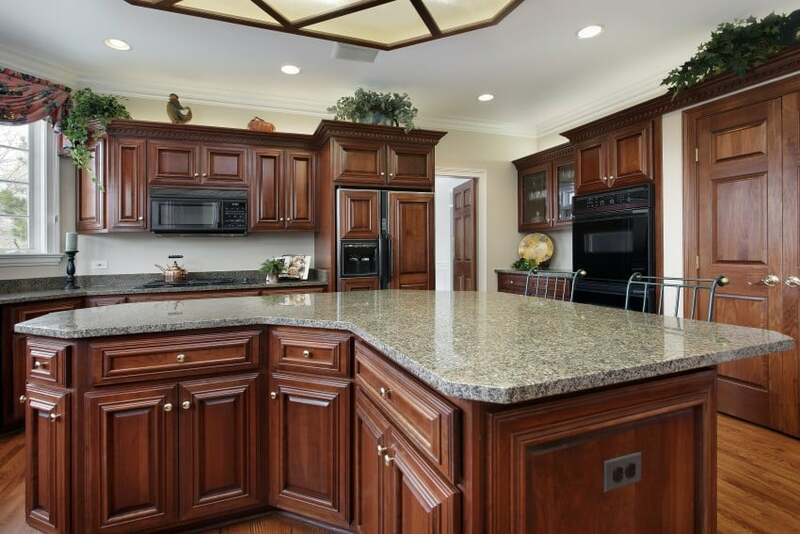 Here is a transitional kitchen design with smooth curves and fine details. This L-shaped kitchen with an island counter opens up as if to embrace the whole room. The arched ceiling detail with accent lighting is a great finishing touch to the whole design. Raised panel doors and ornate crown moldings are the must-have details in a traditional design. Recessed ceiling lights on the other hand add a touch of modern style and are a convenient way to cast some light in the whole room. Here is another traditional design that brings on pure nostalgia and adds a feminine touch with these floral print wallpapers. Shades of beige and brown make up a warm color palette that also inspires a feeling of comfort and warmth. 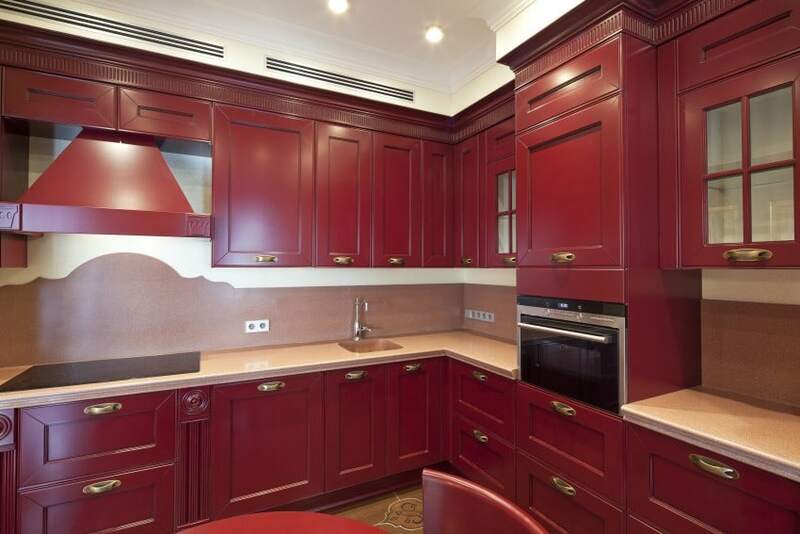 Red is known to trigger a person’s appetite so this red-colored kitchen is sure to get your food cravings take over. Beige and white complete the color scheme as they help balance out the dominant red. 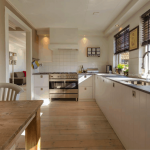 Here is a simple design idea for your kitchen. 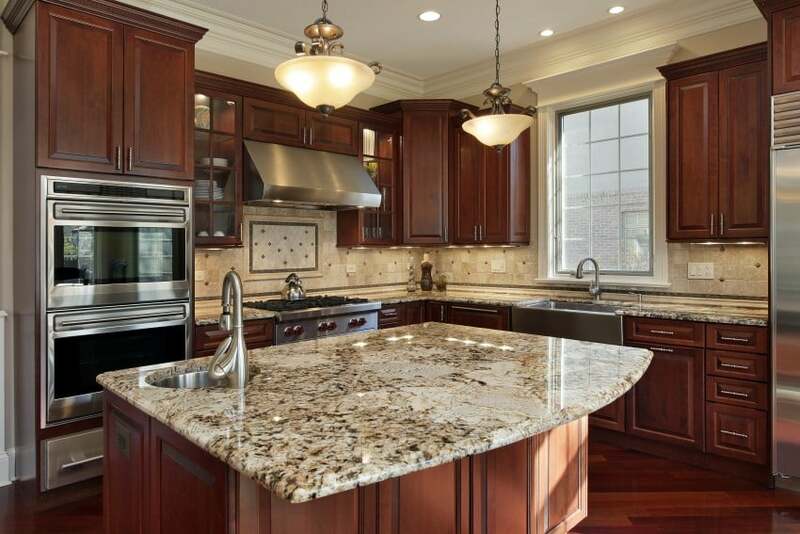 Dark wood and speckled granite is a well-tested combination that you can never go wrong with. Add light beige floor tiles to the mix and apply light grey paint to the walls and you are all set! 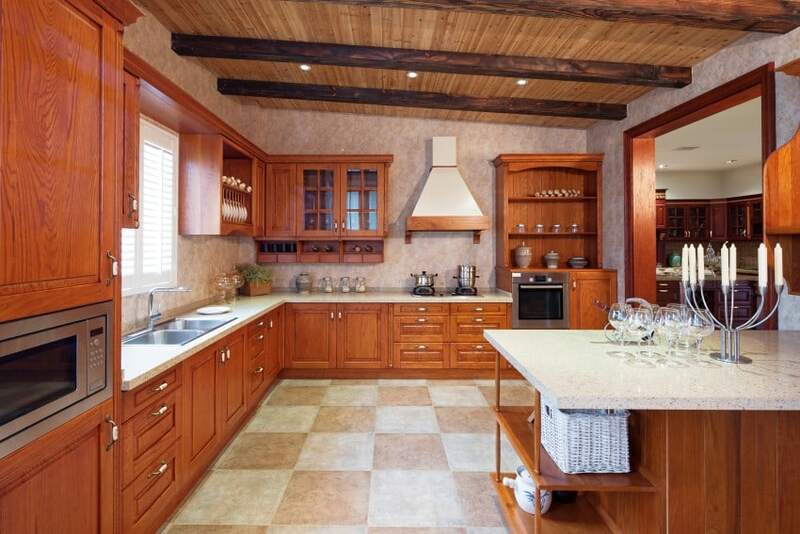 This traditional kitchen with a rustic feel truly is spectacular. A fine choice of materials and colors along with great woodwork and craftsmanship bring out the beauty in this design. Plus, we simply cannot take our eyes off these magnificent arched ceiling details. Can you? Here is another traditional design idea for your cooking corner. Wood cabinets with granite countertops and subway tile backsplashes are a simple yet elegant choice for your kitchen. Be sure to also add a modern twist by having modern stainless steel appliances installed. An accent tiled detail over the cooking hob always makes a great focal point as it catches your eye and gets your attention. Pendant lights over the island counter are another cool feature in any kitchen design. Black and white is a timeless color combination that works for any interior design style. This modern kitchen is the living proof. Black wood and white gloss come together to add a touch of elegance and style, and bring this high-end design to life. Here is a more traditional design proposal in orange wood and white granite. The checked tiled floor is in tune with the general color palette and completes the design by adding some pattern and texture into the mix. 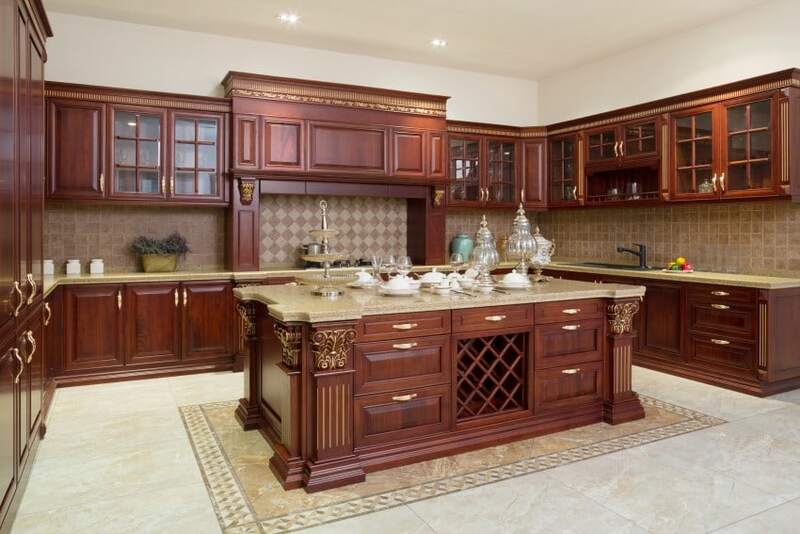 A mahogany kitchen always looks classy and expensive. 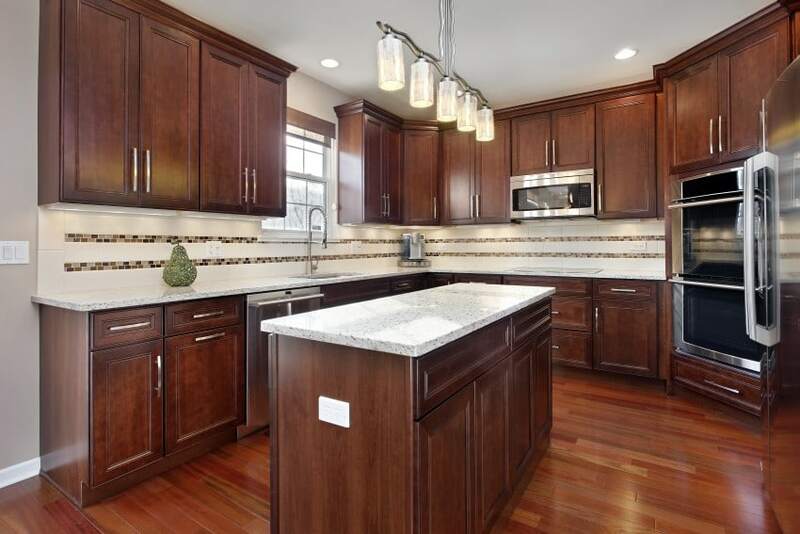 This high-end design features dark wood cabinets with beige granite countertops and tiled backsplashes that are in perfect harmony and pop out against a floor and walls in lighter shades. This traditional design idea features classic details beside more modern elements that are however perfectly balanced. Mosaic backsplashes in light grey are a fine choice that matches the granite countertops and adds texture and depth to the design. 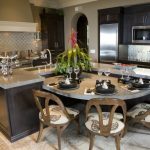 A large island counter does not just add some extra storage space and worktop area to your kitchen, but also makes a pretty cool centerpiece. Be sure to add an accent pendant light overhead to make it even better. 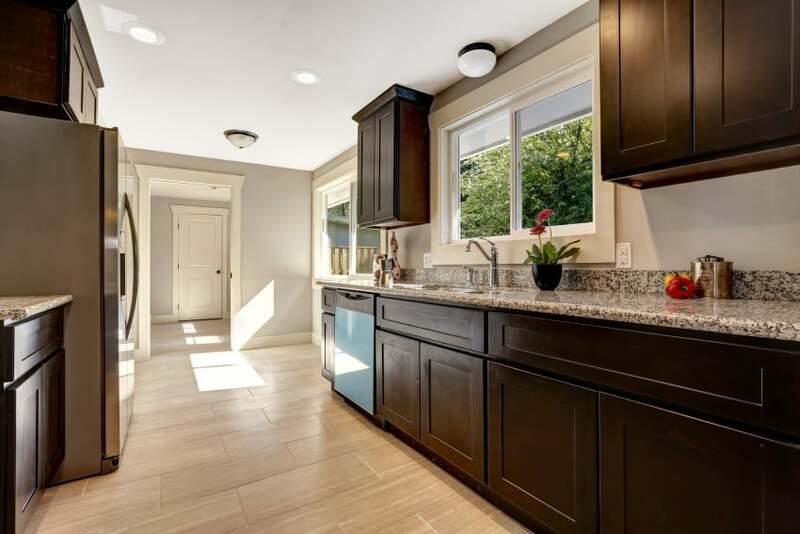 This traditional kitchen design features dark wood cabinetry along with speckled granite countertops and tiled backsplashes in light beige – a classic combination but the diagonal floor makes all the difference by adding an unexpected twist in a pretty straightforward design.